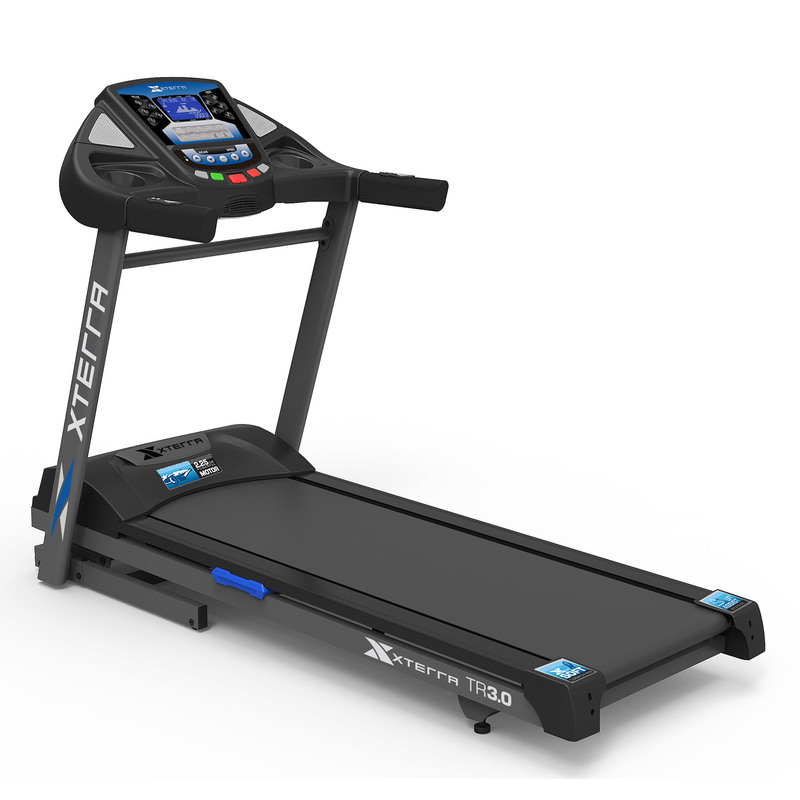 A powerful motor, a high top speed, incline and decline features, a huge number of workouts at our fingertips and easy storage. Seriously, it is no surprise that this product is receiving 5 stars in all of its reviews. So, want to see how you can get fit and workout on the 2950C treadmill? We’re not lying with this statement. The 2950C comes with 40 workouts which have been professionally designed to help your fitness to the next level and seriously activate a full body session. As with many treadmills the 2950C is iFit compatible so you can organise and personalise your workouts within minutes. You’ll also have access to new workout videos every day, interact with message boards, discover new healthy recipes and challenge your friends on real road simulations, thanks to Google Maps. The slightly larger than average running deck of 22” x 60” has Runners Flex suspension so with each foot pound on the deck, you can be safe in the knowledge that you are not harming your joints. You’ll be extra grateful for the suspension as you aim for a top speed of 12mph (22kph). The deck also features unique WhisperQuiet™ technology, so even if you’re pounding the deck hard, the machine will stay as silent as a mouse. You won’t be receiving any complaints from your neighbours. If pushing yourself hard to see how much you can improve is your goal, then you’ll be happy that the 2950C is installed with a 4.25 CHP DurX Motor. The size of this motor is massive in comparison to other treadmill models on the market. But, there’s a good reason for it. With a +15% incline and -3% decline feature (still a luxury in the treadmill world), the motor ensures the longevity and stability of the product. Remember to keep a track of your heart rate by using the EKG front handlebar pulse grips or the wireless heart rate transmitter. 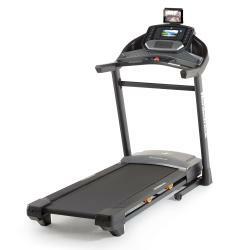 Another model which has this element is the NordicTrack Commercial 1750 Treadmill. 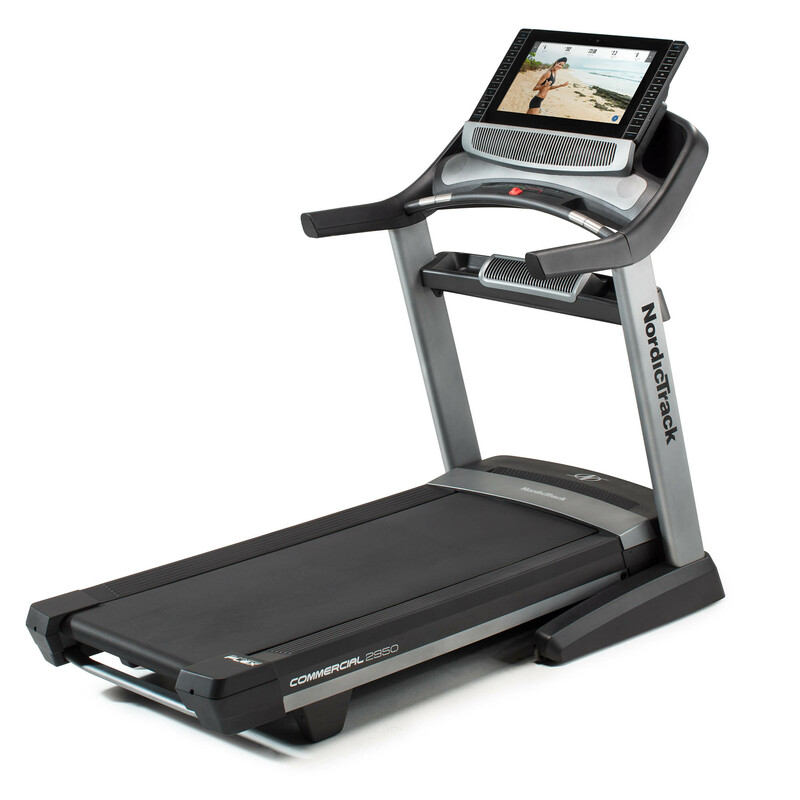 We all know that even low-priced treadmills are now equipped with entertainment options. So, what can you get with the 2950C? Well, the simple answer is: a lot. Ah, you want more detail? Ok, the WiFi enabled, massive 22″ HD touchscreen is the hub of entertainment and stat tracking. The 2050C continues to take things to the next level with Bluetooth audio connection, iPod compatibility and dual 3” speakers. On top of these fantastic features, as part of the NordicTrack Spacesaver designs, the 2950C is entirely foldable. It’s ideal for both part-time users who want to be able to store it away with the ‘Easy Lift Assist’ button and people who may not have much room. It is also a fantastic addition to any commercial gym due to its wide range of features which means that everyone from beginners to advanced trainers will benefit from using it.